I’m a big fan of pudding, but rarely make it myself, so I’m definitely guilty of spooning down Jell-o snack packs from time to time – even adding a little squirt of whipped cream too!I was craving chocolate something fierce this weekend and decided to make homemade pudding with a little bit of Baileys Irish Cream just to make it extra special. Although I have made homemade pudding in past, I forgot how easy it is to make. Not only is making homemade pudding incredibly simple, it also tastes amazing and is a great framework for all types of flavor combinations. Plus, you’ll get a mini workout from all the whisking, so you can feel a little less guilty about this decadent treat. I have had my eye on this banana pudding for another easy dessert. As soon as I indulged in one spoonful of this rich, smooth homemade pudding, my brain went into high gear and immediately started jotting down other flavor ideas. You know how much I love those miniature bottles of liqueur – so be prepared for more ideas in coming weeks! 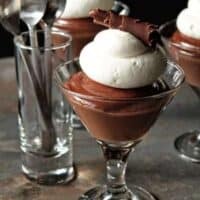 I served up my homemade chocolate pudding in small martini glasses, topped it with homemade whipped cream and chocolate curls to give it just a bit of elegance. Fancied up Baileys pudding – what more could you ask for? 1. In a medium saucepan combine sugar and cornstarch whisking to thoroughly incorporate. Add milk and whisk until dry ingredients are dissolved. Next, whisk in the egg yolk and cream. 2. Place the pan over medium heat, whisking constantly until the mixture comes to a full boil and thickens. 3. As soon as the mixture thickens, remove the pan from the heat and whisk in the Baileys Irish Cream and vanilla. 4. Add chocolate and whisk until it is completed melted and smooth. 5. Pour pudding into individual serving dishes. Let the pudding cool slightly then cover the tops with plastic wrap to prevent a skin from forming. Refrigerate for at least 2 hours before serving. 6. 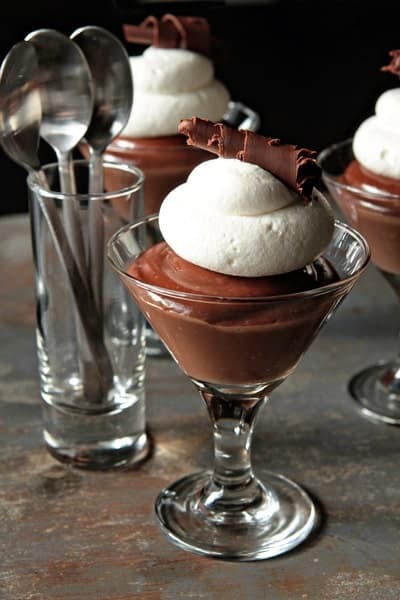 If desired, garnish with fresh whipped cream and chocolate curls. - Just in case you are curious, the mini martini glasses were purchased from Pier 1, the spoons are from Ikea. I made this tonight and it was delicious! Maybe I should have sifted the cornstarch because I did notice small clumps? Regardless, it was easy to make and really yummy. Baileys in anything is my kind of dessert! I love that you post where your dishes are from!!! I LOVE dishes, it’s actually a problem. Don’t stop posting where they are from!! I’m making this dessert again over the weekend and want to know how you make the chocolate curl on top. What kind of chocolate and tool do you use for it? I’m sure I’ve got something in my patry to use for the curl. The skin is my favorite part. Why would you not want the skin? Just curious. I absolutely love this recipe and my boyfriend keeps requesting it. Works really well with flavoured Baileys too. I dont comment much but i am a regular follower of yours. Can u plz suggest wat can i replace egg with in the pudding..
You could try 2 tbsp cornstarch + 2 tbsp water for each egg. I hope this helps. Yay! So happy to hear you loved it. Thanks so much for reporting back! Happy Holidays! Hey I love your recipes! You’re in my bookmarked websites! Is there a substitute to Baileys Irish Cream? Please say yes. Hi, Ayesha! Thank you for your kind words! You can add a coffee liqueur if you like, and if you’re looking for something non alcoholic, I think an Irish cream flavored coffee creamer would work. I hope you enjoyed it! Can I skip Bailey’s and just make it regular pudding? Hi,, Michele! You can totally skip the Bailey’s if you like. Some people use coffee syrups in place of it. Or maybe you could just add a little extra heavy cream. I hope you enjoy it! Looks yum! By 1/4 the cup corn starch do you mean the powder itself or powder mixed with water? Hi, Anuradha! You can use just the powder itself. I hope you enjoy the pudding!